Just a little test to see if i have this working correctly. 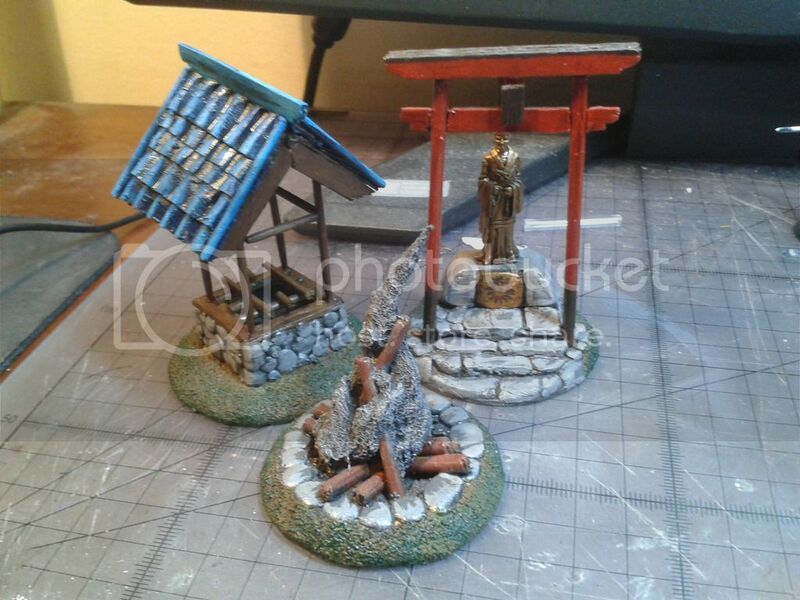 Here is my 30mm Roadside Shrine based loosely on the save point in Mini Ninjas. its built from off cuts from other projects with just enough paint to make it useable. still planing to finish the paint and dress the base with some flock but not too much more. 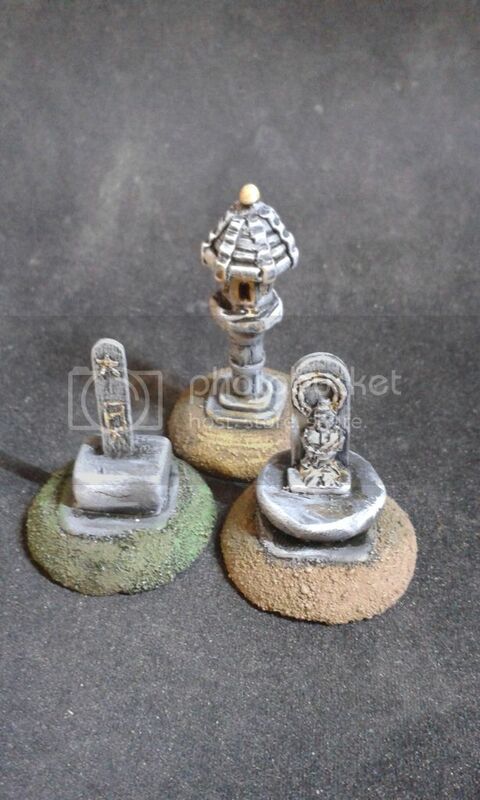 my 3 30MM idols based on some Li family monuments. These were early experiments with sculpting which reminded me i don't get on with GW type Green Stuff. for some reason i just cant get used to the curing process. 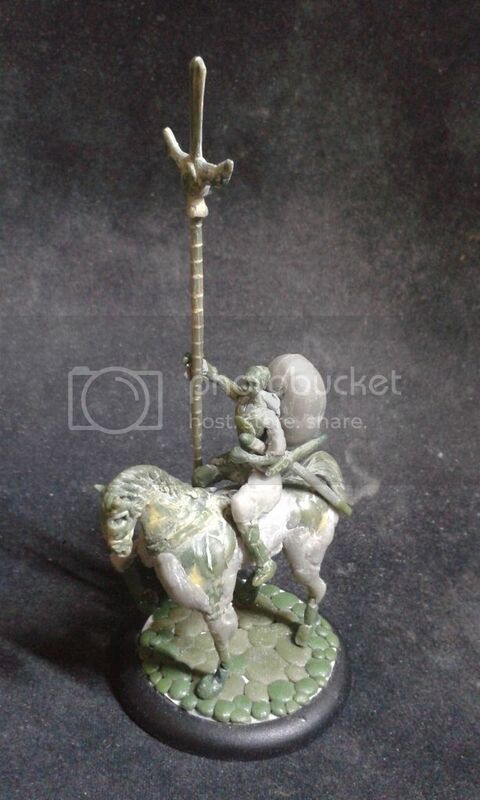 I've moved on to Apoxie Sculpt which wile more expensive, is a resin that handles more like clay and blended with green stuff give you the best properties of each. these are formed left to right on a coffee sterer, bamboo skewer and lolly pop stick. I also like working with Apoxie sculpt. It's taking me some time to figure out when the best time in the curing process it is to work with it, but the more I use it the more I like it. i like it because it is just like the clay i used at school and collage. You can just work down to the finest detail as it cures but i think it does benefit from a third blend with green stuff to remove some of the bitty ness while its soft. Must also admit that when i am being a bit lazy, i just let it set and carve into it afterwards with wax tools. i decided to go with a rough hewn look for a couple of reasons, i plan on coving around a third of each with vegetation and leaf fall so it would be difficult to justify so much detail. Fleafa's excellent work also hit the forum when i was roughing these out of miliput and helped me realize that it would take a fair bit of time to get a newly constructed look. 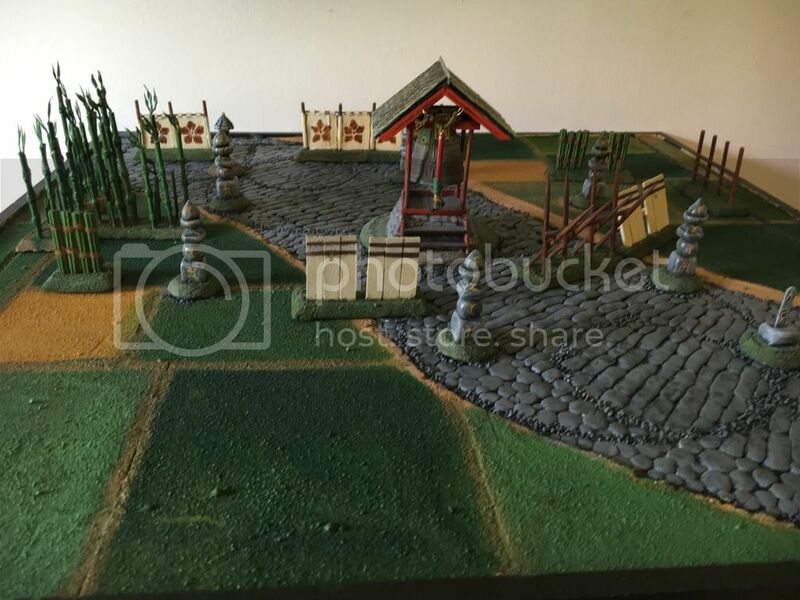 Now for some fun stuff; 3, 50MM objectives. One town well, I'm not sure how durable the cocktail sticks will be long term but corrugated cardboard does make excellent roof tiles. One Signal/Camp fire, took me a while to think up a third concept for this set and making the smoke from cotton wool and super glue was interesting be careful of the fumes. they are not pleasant. 3 100MM pieces, as the basses are bigger i have tried to get them a little more interactive. 1 Watchtower based in part on a Osprey Korean invasion illustration. the platform will support three 30mm bases and there is a ledge halfway up as i figured if someone thought the could get a figure on/inside then they will try and i don't want the blame for things getting broken. i changed the roof from wood to tiles to fit in better with the Ryu concept art. 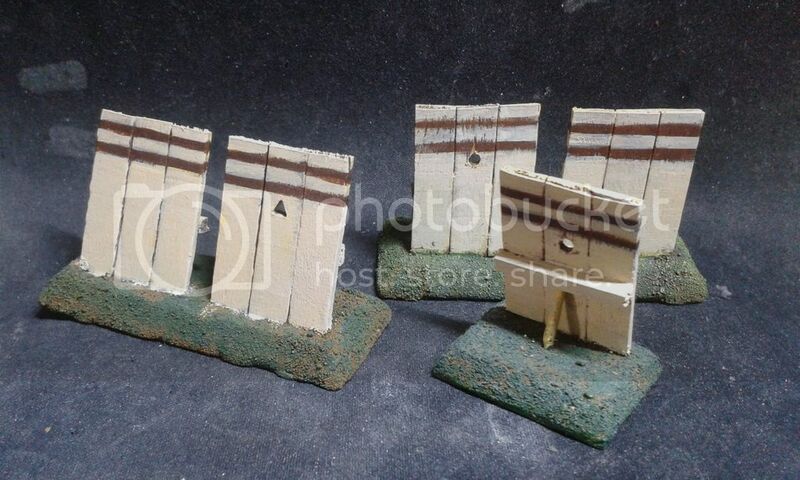 1 Tori Gate, pretty simple this one, just 9mm dowel and lollipop sticks. i've gone with red and brass to contrast the white/blue/brown of the non dragon temple stuff. 1 Temple Bell. this was fun as i wanted to get something that worked so if this gets captured, ring the bell. its twice the size/scale than i wanted and has a different clapper so i had to compromise. Apart from that its a traditional Japanese wind chime to the right pattern and has got an unpolished finish so i don't need to try and get a verdigris effect. Wow! These are stellar! Obviously a great deal of thought has gone I to these. They look excellent, are wonderfully thematic, and are pretty original. Very interested to see what else you come up with! Thanks again. its mostly how far i got between Salute 2013 and 2015 so i have a bit more coming up (but still nothing finished) been on a break recently due to the birth of my son a year ago and the realization that i had little experience painting models with more muted, natural tones as like most. i have quite a bit of GW stuff collecting dust. i have been working on some small 15MM WW2 Germans recently and this has help fill in some gaps for what i need to complete. The Model Color Panzer Series has some excellent colors for basing and been playing with some easy mold, so that i can press mold copy some bases for my half of the ROTK Kickstarter. i took this photo Christmas 2014, the last time i had it all out before having to clear out the room for the Munchkin. The base was fun though, was trying to work out what Wraith was doing, figured it looked tree like and went with the emerging out of the ground theme thinking that "Sum Jung Gi, was taking in the Sakura at the moon bridge, the clouds clear, wait, that's no Cherry tree! Splat"
Still plenty to do though. might have to add a single geta to the bridge now. That bridge idea on the base is a pretty interesting idea. It really is crying out for a cowering soon-to-be victim! It really is crying out for a cowering soon-to-be victim! 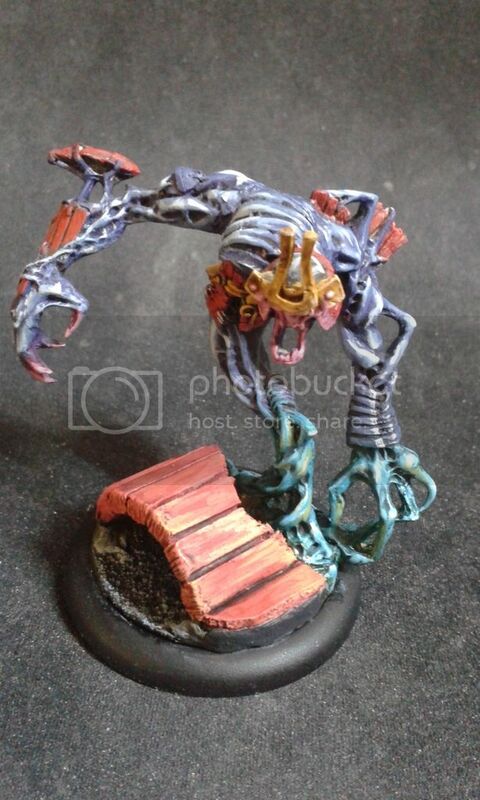 The girl from the Nightwing Swarm would work well, as that model also comes with a tree stump as support for the bats. That "slip way" clip is hilarious! I hadn't rued the tin foil water effect method before. I'd be very interested to see how that works. Not really a method, just the first idea i had on how to go about it given that i need a mold that is going to hold the effect and be removable afterwards. Not certain its going to work but will post the results when i do. It tends to be the result of over enthusiasm. i normally start by thinking would this look cool, and then have to work backward to see if its possible and if i think i can make it. Sometimes it doesn't work, i tried to make a Udon and ramen stand. one of which looked like a Normandy Bunker for a while before i took a hacksaw to it. twice. Sometimes it grinds to a halt, I'm stuck with Araka painting the head, for some reason i cant get the remnants of the face and mask to work together. 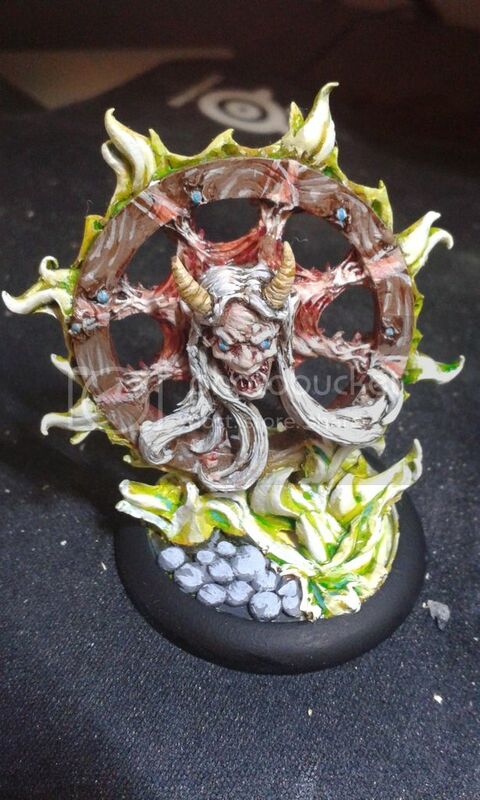 Others, well i was inspired by your earlier greens, the thread on potential concepts for possible models and rather wanted something large to play with. figured i had read enough on how to do it and with Apoxie, it was worth another go. its an attempted copy of a statue of Maeda Toshiie at Oyama Shrine, Kanazawa. aiming for the rider to be around Hansou's size with the rest scaled around that. still packing out the volume and not really looking forward to the details. 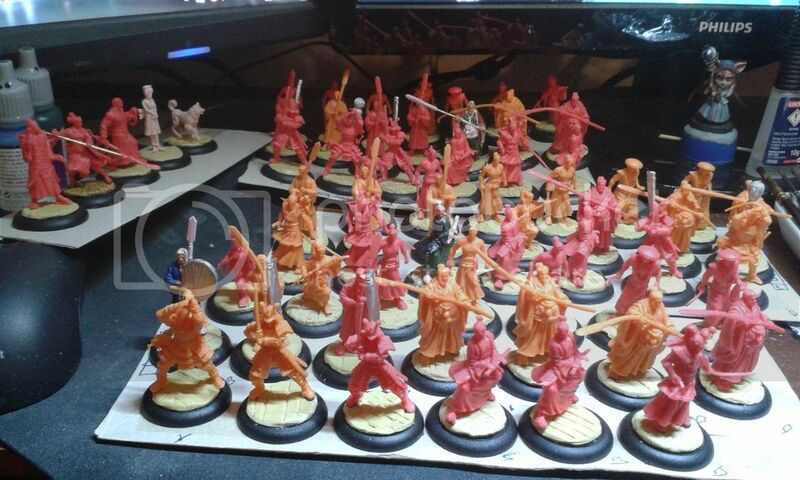 i started with a Warring States/SW3 theme to get something a little different to the studio set. these are still in progress so will get a better pic once they are done. unintentionaly they have ended up with a yellow/blue/purple palete and mostly indoors bases. Daisuke a mix of a period doctor picture i found and Kanbei Kuroda from SW3, mostly due to height. i got a little carried away and built a box for the back of the base. Yukio Koshimori, Banner is based on Nobunaga Oda, Clothes are from a NSFW Manga as i found the picture before finding the series it was part of. Kioshi Makoto, i appear to have lost the reference for this one, so will need to remember and was pondering a telescope so had started the base. 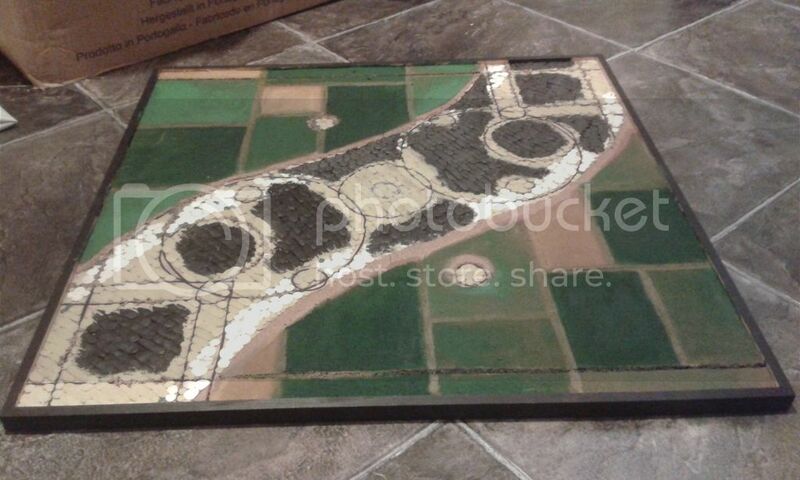 This was my first project intended to be simple and quick, to get some games underway without needing proxy terrain. Most can be built from cooking/party supplies from a good size Tesco's. they have a little paint on them to be useable and need finishing. 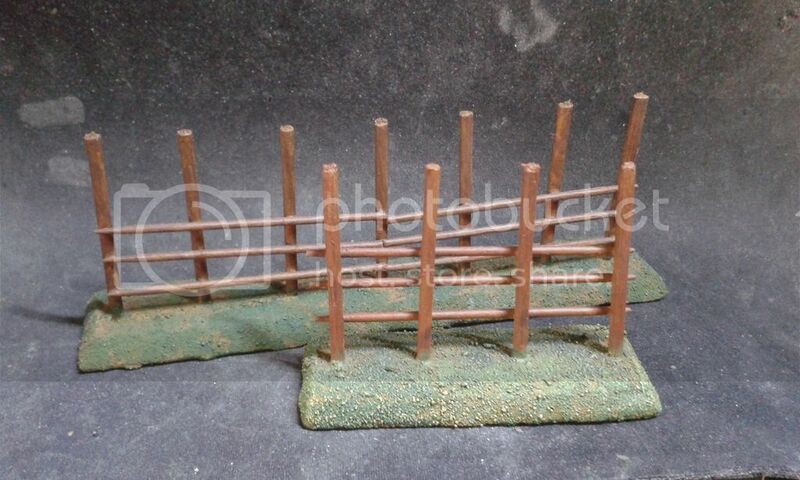 1) Japanese Style fences.These are more regular than the source but i wanted them to look newer. they are Bamboo Skewers for the uprights and Cocktail Sticks for the cross beams, i have one, 6 by 1 inch and 2, 3 by 1 inch. 2) Anti -Horse(Oni) Traps. These i thought were in a computer game but not sure now, they use the spikes from the Skewers in the first project but twisted a little when putting together. It helps to put a little glue on before cutting the skewers to get a clean separation. 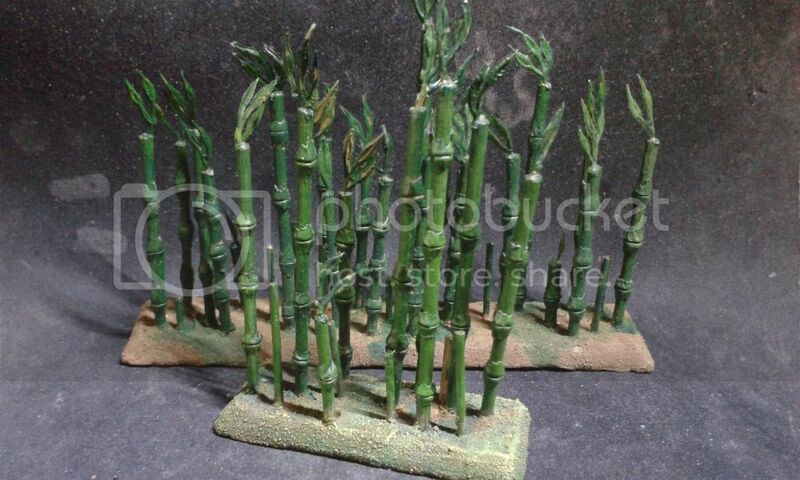 3) Bamboo. built this before the book came out as a guess but are not quite right, just didn't think it was worth changing. the leaves are from a Pets at Home fish tank plant dismantled. 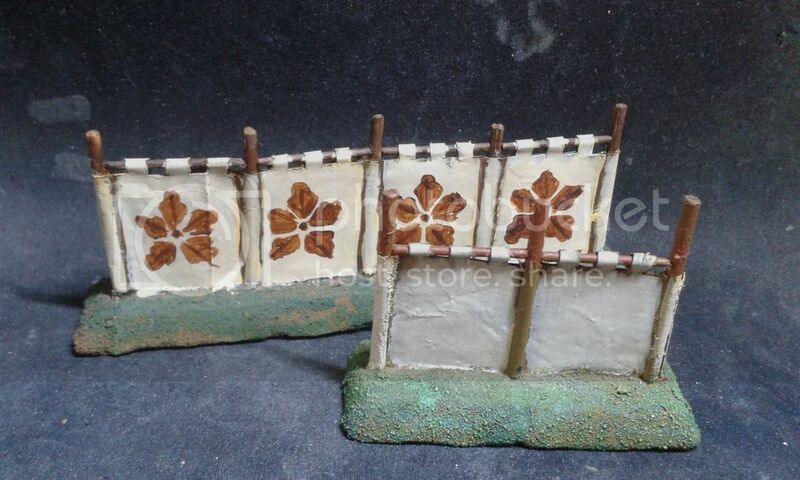 4) Generals Enclosure Curtains. More Skewers with Cocktail Sticks between them. The Curtains were made from Cup a Soup packets, cut open, folded over and then stuck in place. 5) Japanese Portable Shields, Made from 1.5 Lollypop sticks, 1 matchstick and an off cut of cocktail stick. 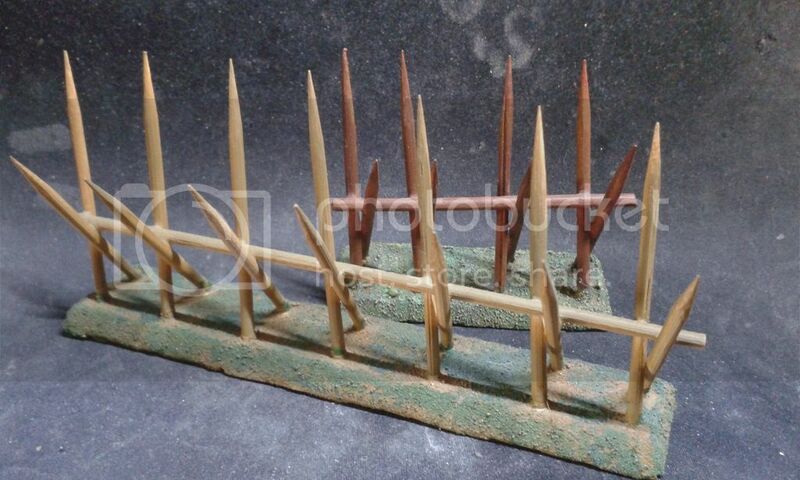 i drilled a hole in every other one and filed it out either round (Bow) or triangle (Musket) i changed the bases for these, went with two 3 by 1 inch and 4 1.5 by 1 as it looked a little better. 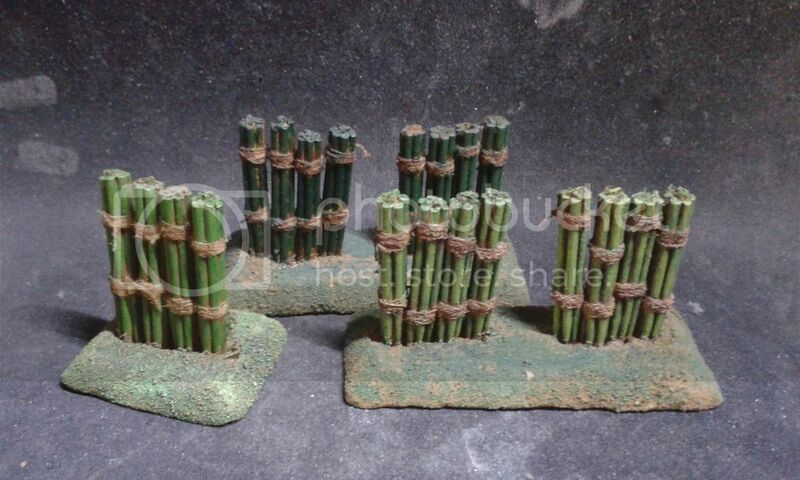 6) Green Bamboo Shields. these should have backs like 5, but i put them in the ground like a Gabion for a little variety. Each bundle is 7 cocktail sticks halved and bound with some cotton. lots of cool stuff here! how do you find the time to do all this?? I think its was the last flourish of pre kid lifestyle as i have slowed down for the last year while i adapt to having a Son around. Apart from that i just try to work to a pattern that keeps me productive. typically i will have a think about a character when the promo comes out, i will try to build, prime and foundation paint a model as soon as i can so i don't forget what i want to do. i start projects at the weekend so i have more time and energy. i use evenings once every ones gone to bed to work for an hour on stuff i have started and try to make sure i do something every day, no matter how small and it soon adds up. Best thing i was ever taught was to make sure you have a couple of projects on the go at once. So if a project gets stuck you can take the time to work out what's not working and how to fix it rather than trying to force it and having to start again or giving up completely. Chojin (Richard) and his warring states Prefecture reporting in. 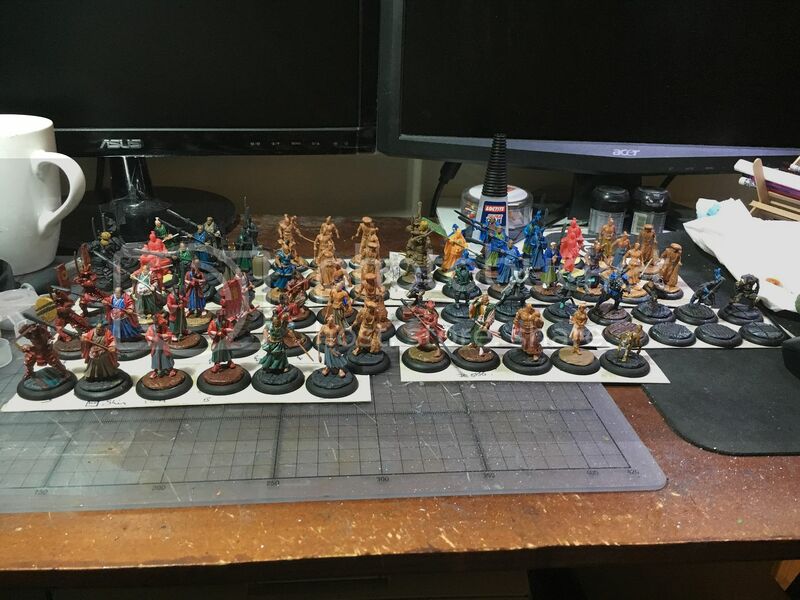 I’m formally a GW collector/modeller, re-enactor and DnD player. Found out about the game through Countess (we are married) while she was looking for oriental themed games and something that is a little more portable to play. One day I will finish something. busy people always seem to get more things done! unlike lazy buggers such as myself. 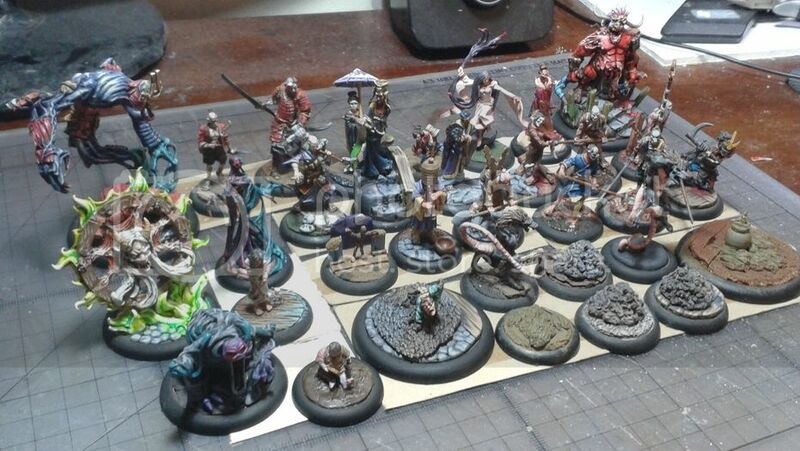 taken almost a year to paint 9 models and i quit working to go to college so i've had loads of extra free time too. i should also have said that it is also a work around for an inability to get a project through to completion. 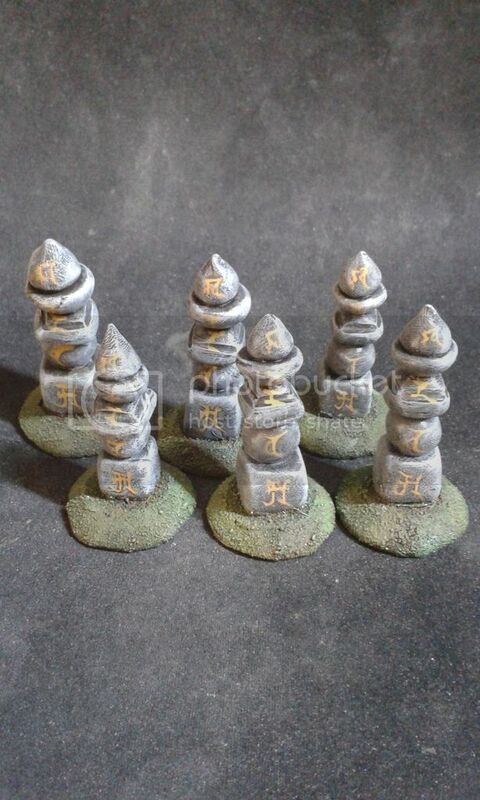 I've started chipping away my half of the ROTK Kickstarter and its first job to re-base them to match the Bushido Metal Range, so to do it a little quicker i have been experimenting with Instant Mold so i can cast as many as i need and not make each by hand. 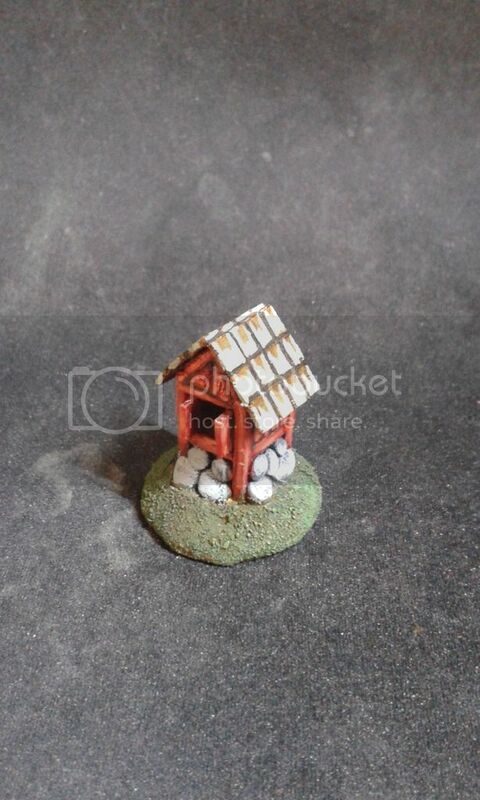 i make bases a little different to the tutorial but not by much. i took a number of pictures of the ROTK boards to take patterns from to save time. normally i would sketch the idea with a biro as if this fails, its not a good idea to try and make it. 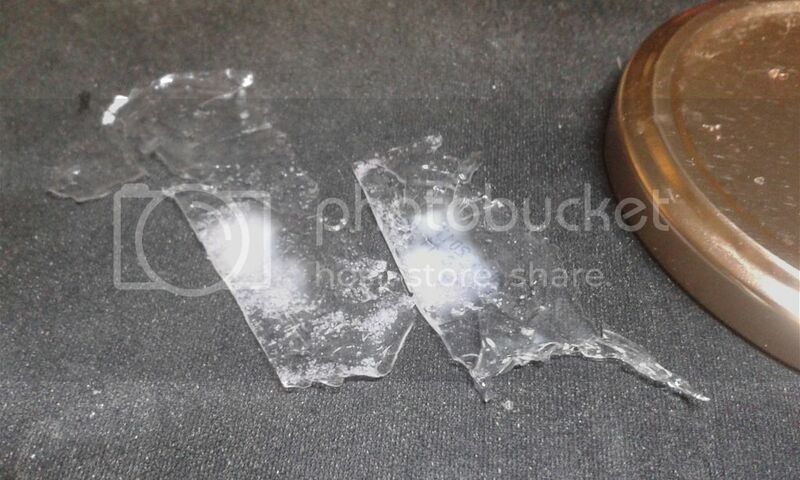 Instant Mold is a heat activated silicon, so if you drop it in boiled water it gets sticky. Then press in the bases, once it has set/gone cold they will fall out and you will end up with the imprints above. You need a cold cure resin other wise it will reactivate as the resin sets and from my experiments Milliput appears to work best as its nice and sticky and can be removed at around 4 hours. Apoxy Sculpt takes far too long to set and Green stuff difficult to mix for large batches as it gets too though to work with. 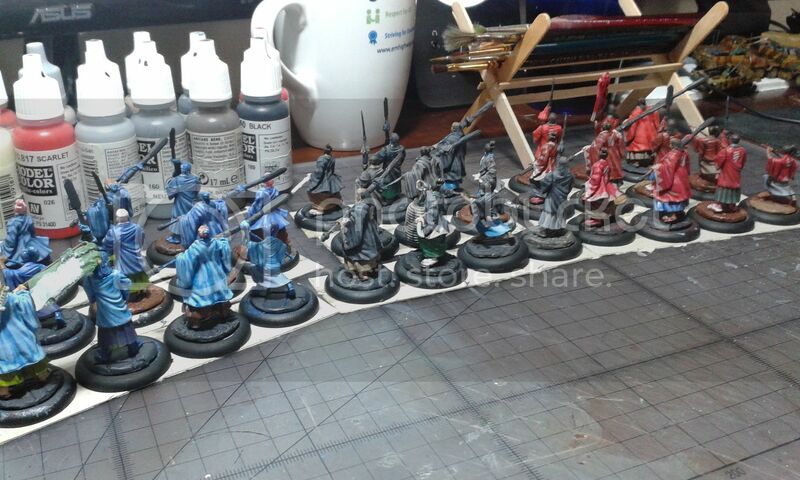 So here are my ninja with a batch. 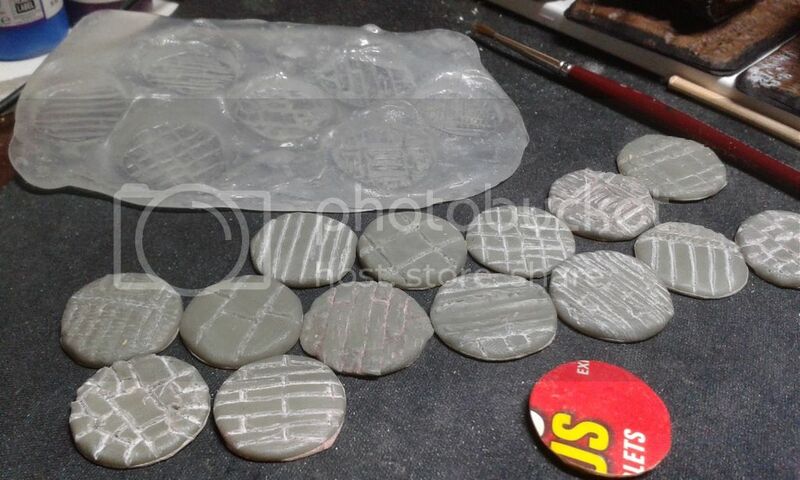 the bases are a little rough round the edges, i could have sorted this with more preparation but as i am impatient i will fix that as i go along. 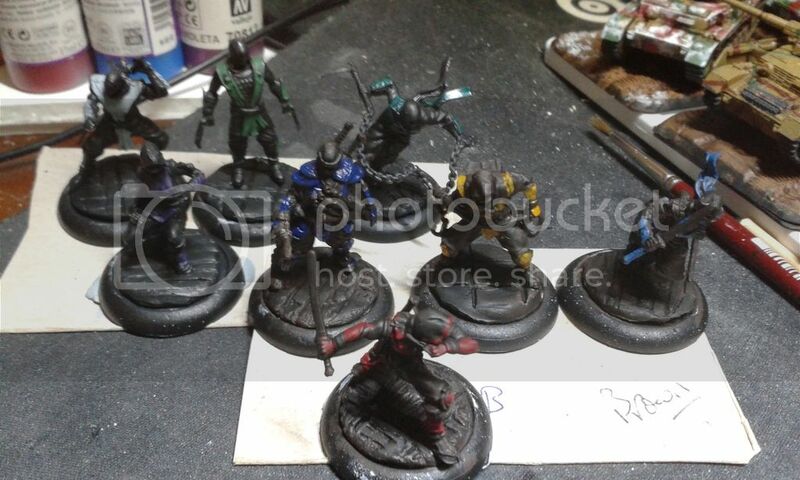 the ninja are just primed and flat coated with an all over dark coat and ink. I am just starting on testing the overall theme wich some might be able to guess. i had always meant to pass on details as someone may find them useful. it also gives me a record when i get distracted and inevitably forget what i had been doing and you also never know what help may come back to move a project on. 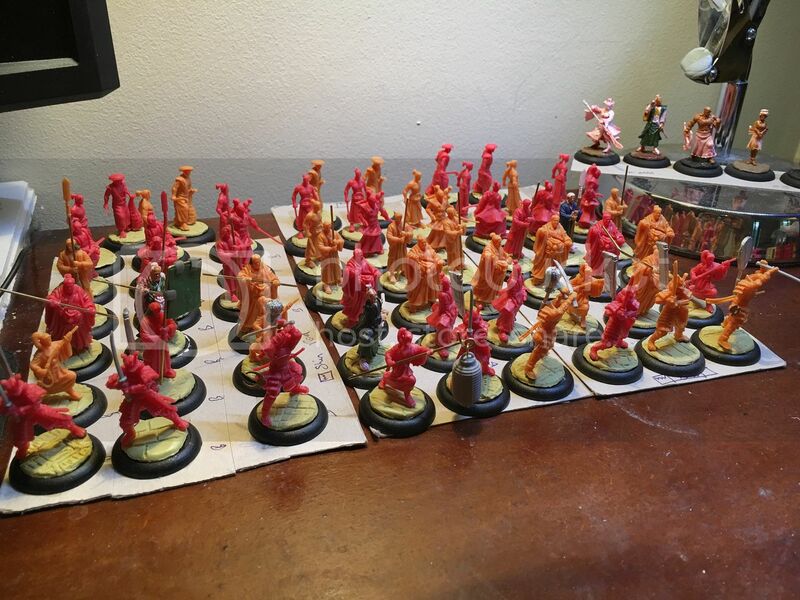 Here is the rest of the KS, i have divided them up for batch painting otherwise i will never get them done, next step will be replacing some of the bent yari shafts. some are 2mm and some are 3mm so its a bit of a fiddle. the eventual aim is. Unique figures are going to be Nobunaga Oda and No. not decided on the dock boss and hostage but will be having a go at a gold Shiba Inu. added some VAL72135 Verdigris to the brass to try it out, i suspect any Cyan would have been fine. started adding water effect to the base and drooped in some Sakura scatter made from Gale force 9 snow, dyed with 2 red/1 purple ink until softly pink. I tried they experiment with Water effect, fair to say it didn't work. easier to make flat and bend to shape. the crumpled foil did give a good ripple effect so this might get used at another time. 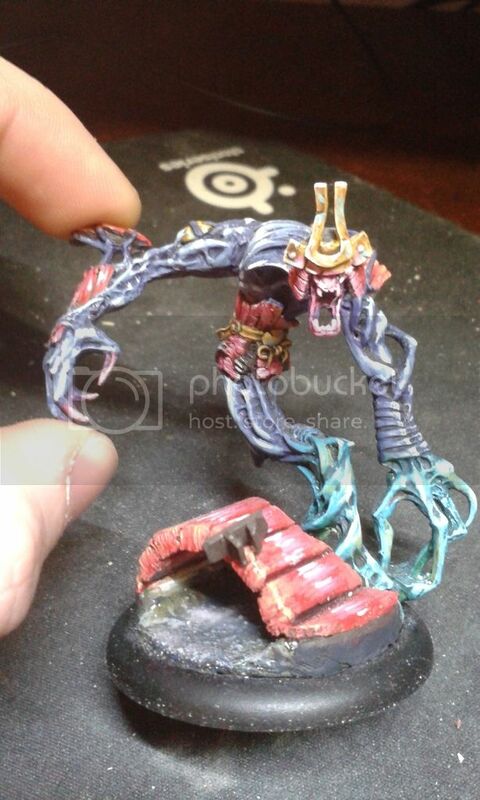 managed to get back to some painting and carry on with Wanyudo after some of the basics. ive mostly been building up the flesh and experimenting with the wood. i adjusted the angle its mounted on the base so that the face is level, the wheel is off-set to the left and a little more upright by adding Green Stuff under the right hand side. still plenty of work to go but i was quite happy with the Vallejo Fresh Blood 72.132 and Dried Blood 72.133 effect paints on the flayed skin. i hate set up, a bit of a throw back to larger skirmish and wargames ware you need the tape measure and 30mins just to mark out the terrain, objectives and deployment zones. so this is my take on a pattern with all the required measurements worked in so hopefully it can be town, temple and rural with only a change of scatter terrain. 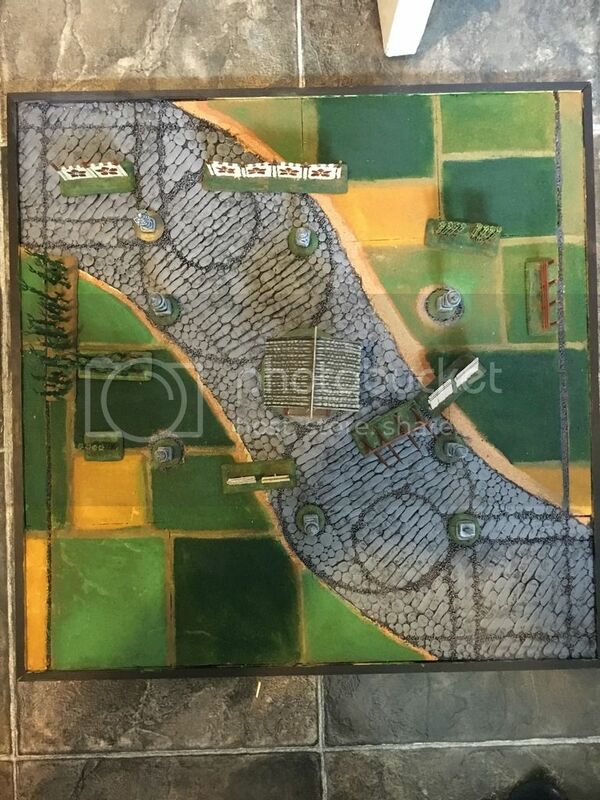 i went with the easy option of a road to link the various objectives having marked them out in pen, it is a little wide but not too far out from the Ryu city in the rule book. Most Japanese pics i found online have slabs to the Centre and cobbles at the edges so on it went, shown by the unintentional difference between the yellow and white milliput. i have started to fill the lines in with smaller stone/gravel to look like drainage/repairs but this is taking a bit of time to get right. 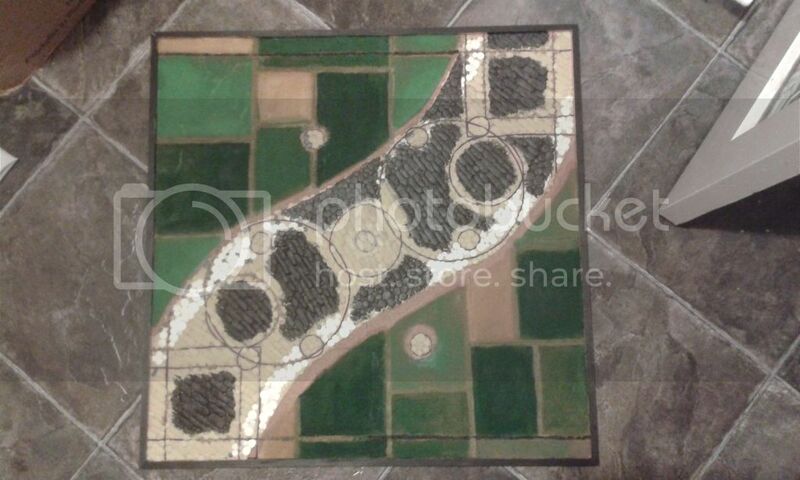 the grass areas started with 6 inch squares of cork board to raise the height but as the texture was limited i have covered it with sand in rectangles and painted so it resembles small back gardens or farming plots. the paints are Daler and Rowney Hookers Green, Sap Green, Yellow Ochere and Opaque Oxide of Chromium. the walkways are Vallejo GrunBrun Surface Primer. So from above you can see where i intend for the items above to fit depending on scenario. next i need to finish the road and give it a once over with Army Painter Quick Shade (Dark) then i will paint it properly. turns out thining the glue and brushing on wasn't enough. works much better squeezed straight from the bottle to fill the little trenches then covered with gravel then compacted down. it took a couple of goes to remove the loose and stuck excess from where it wasn't wanted and then primed/painted with three different grey mixes from D&R black and white tubes. couldn't resist dressing it with some of the terrain above to see the effect. so from above, the effect is a little more obvious due to the extra shading in the smaller gravel . What a great looking board. Good work. Tempura and Soba Yatai stands and a notice board. the first two were on Wikipedia and one of my first projects that have been through several revisions before i was happy withe the scaling. the notice board was simplified from an illustration and i might change a couple of the facion symbols as the front two have enough paint to use but plenty more work to finish. bit of an experiment to see if i can make a cheap large tree while getting the scale and volume about right. its currently 24.4cm high on a 50mm base. the frame is oasis wire for the upright and extra branches, bulked out with Tescos value bandage stuck on with hobby tack. i bound this with oasis tape for texture and wired in some extra branches to the original stem ends to help fill out the final effect. each wire end has a piece or ripped up Tesco basics sponge skewered and stuck on with with hobby tack and i then cut away the sharp edges for a softer effect. 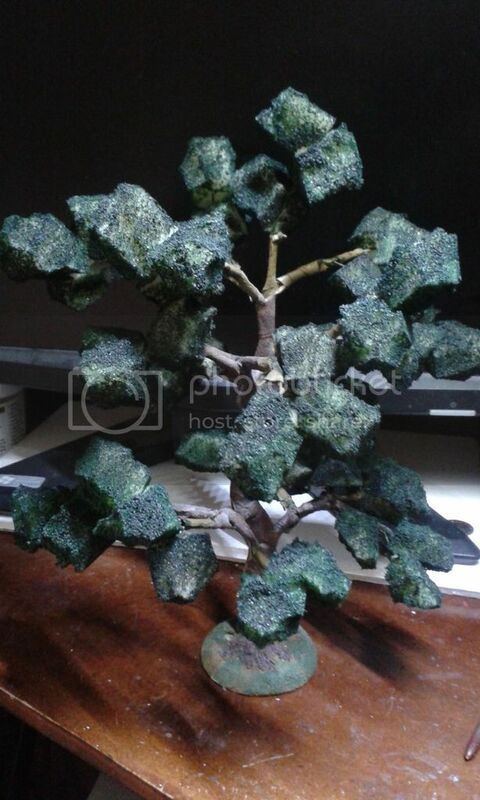 it needs some more painting then will experiment with gluing various leaf products over each piece of sponge as i am aiming for a bonsai autumnal oak. Those fastfood-stands are quite brilliant. Well done! 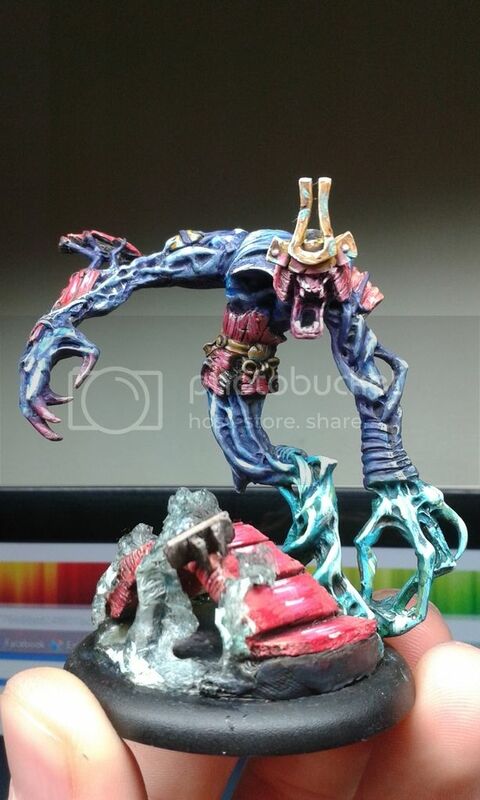 some of these pictures are up on the Facebook group https://www.facebook.com/groups/978331922263243/ but as I've not posted for a while, heres what I've been up to. 2016-08-06 while i had decided to replace the Yari, i then decided to do most of the Katana. 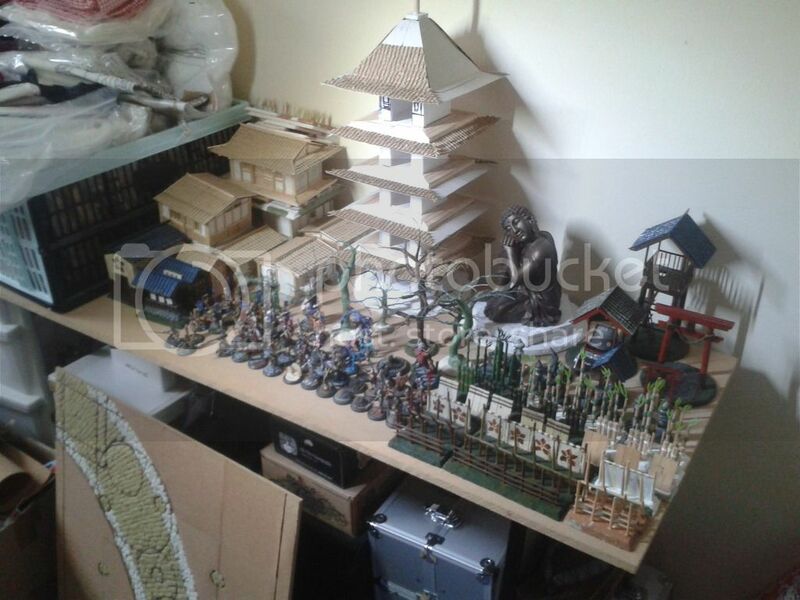 parts fitted include Perry Miniatures banners, Oshiro Model terrain helmet crests, Albion alloys 2mm brass rod and from Master Crafted Miniatures 2 Katana packs, 1 tanto set and a pair of the tall lamps. 2016-08-08 a good number of the weapon swaps complete, red and blue squad have large banners. black has a lamp. I've re-used the original Yari heads which needed a compass arcamedies/ GW drills and some very fine bits to fit back on. 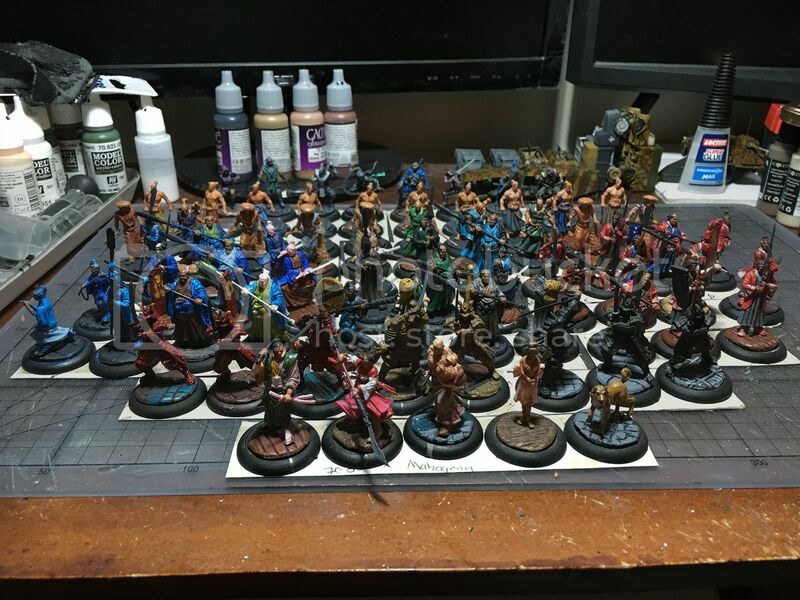 2016-08-17 starting to under coat / flat coat the minis. 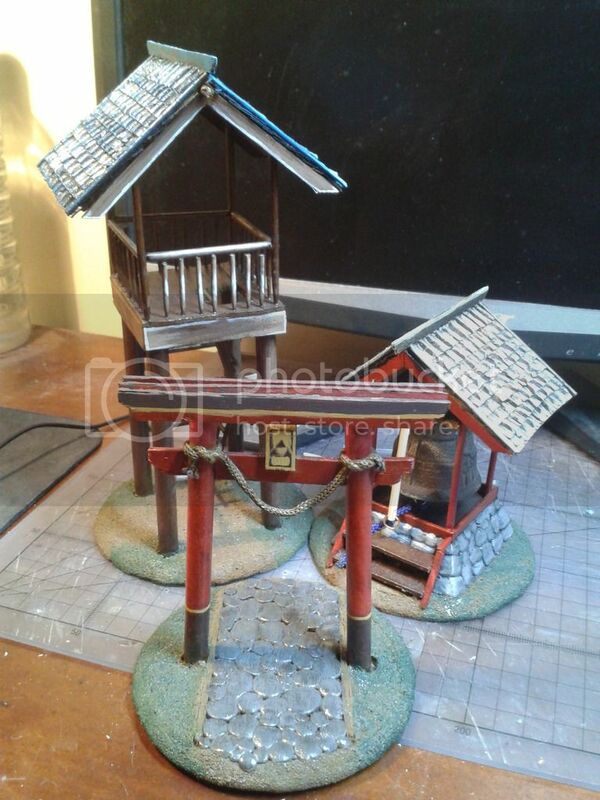 also fitted a lamp to the Watchtower and Shinto streamers to the Tori Gate. Oddly the streamers are easier to just fold from paper than sculpt. 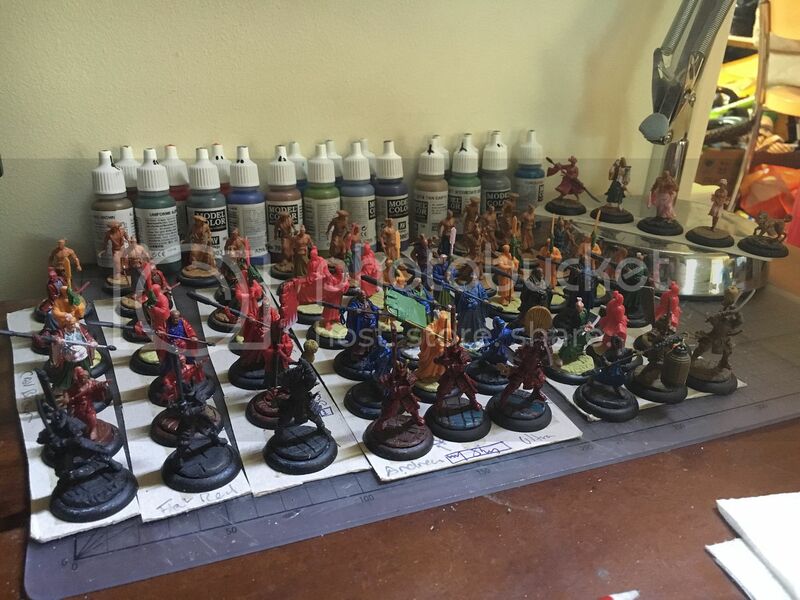 2016-08-28 figured i will need to be methodical to paint this many figures so i am trying to batch paint. 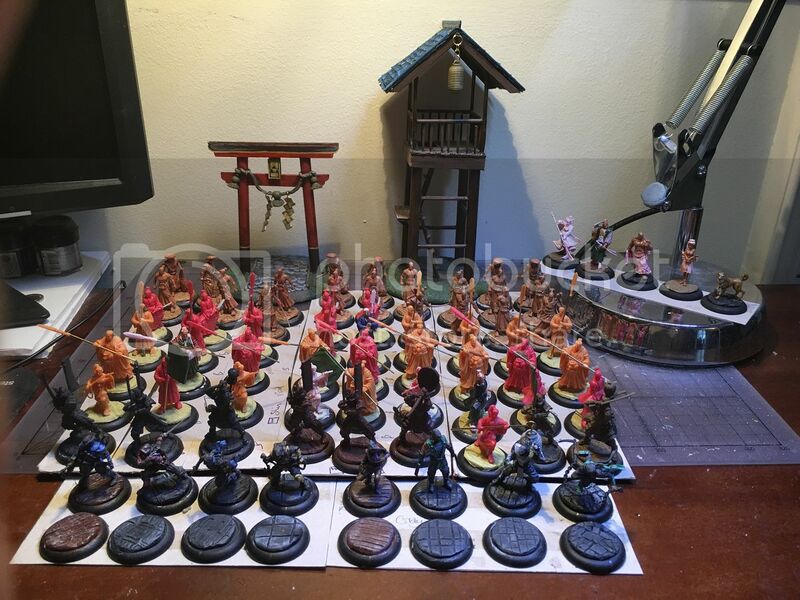 there is a light/mid/dark version of each coat color with a brown/green/grey/blue per squad for the kimonos. also did a little sculpting including repairs, changing hair cuts and finishing the yari off. 2016-09-06 One month in, time for a class photo. 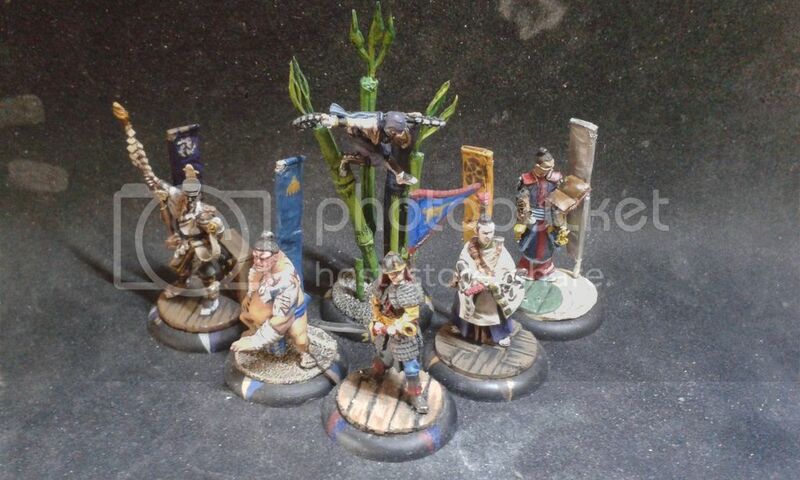 I'm not planing on collecting the Jung Pirates so will be painting them as part of the three squads with the same kimonos and a bit like yakuza. 2016-09-22 most recent pic, just a close up of the Dark/mid/light coats with Dags and Kanji. not finished but experimenting with a flat coat of color, three gradual highlights with ivory and ink washed with the original color/medium mix. Also this way i can work along on the coats or front to back on the same kimonos. That is quite the undertaking swapping heads/weapons/hair cuts. Color me impressed! Cult of Yurei, Post Halloween. 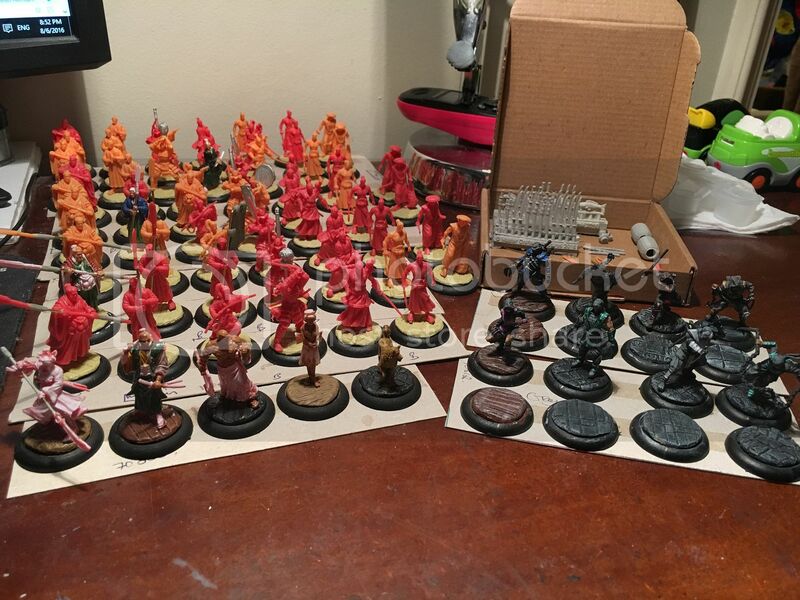 i have a bad attention span so before i hit the burn out stage with the ROTK, i switched back to a different project i have been working on, some cult for my brother. 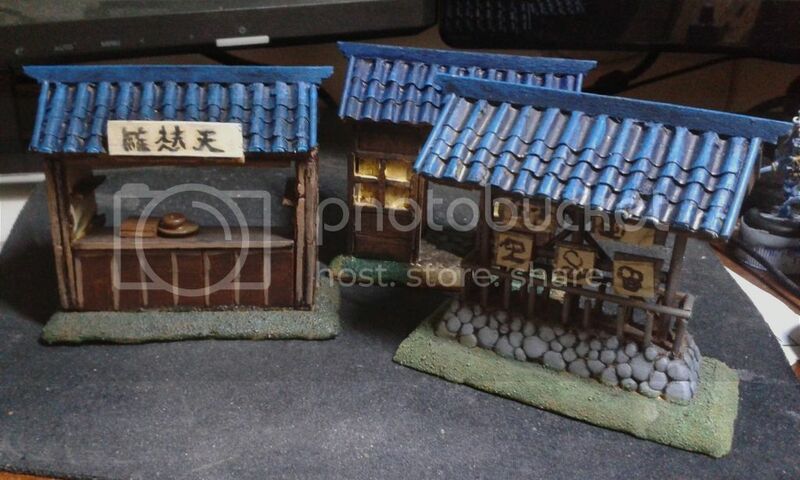 i have hit the first mile stone with these by building the last of the bases so now to concentrate on the painting as i need the storage space. Here is everything i have been given to do and a couple of home brew rat swarms. Wanyudo, has had some of the VMC fluro added to bring out the flames. The Marionette, i like this little guy so i figured i would make the base a stage based on the promo shot background so he can be a giant. still got too much left to do but here is an experiment with Cling film, Super glue and Plastic glue to get a crested wave effect. Some ink paint and water effect still to go but worked much better than the last try.